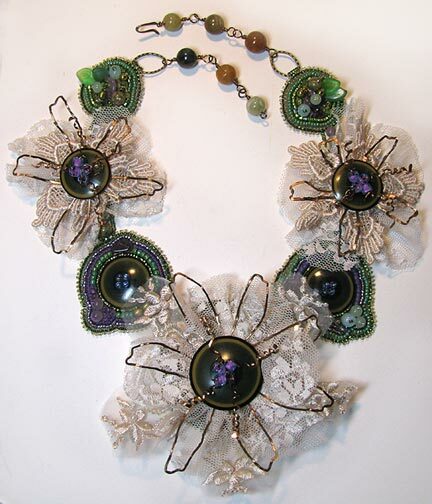 Last week, I showed you how I turned some pretty French Ivory (antique celluloid) buttons into mixed media flowers to use in a necklace. 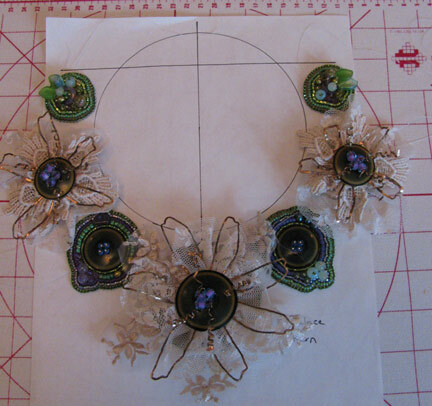 Now I want to share with you how the rest of the necklace came together. 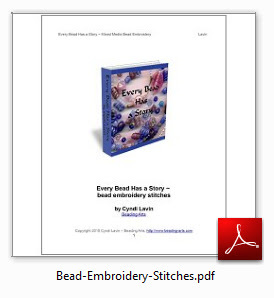 If you don't already have a copy of my free e-book chapter called Bead Embroidery Stitches, please help yourself. Visit the link and scroll down slightly until you reach Chapter One of my book. It covers all the stitches and finishing techniques that I will show here, but step-by-step for those who would like to learn bead embroidery. 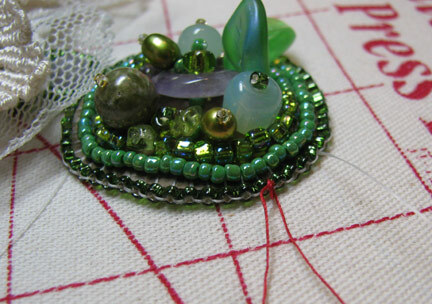 Stitch some small bead embroidered pieces to coordinate with the mixed media flowers. Add a backing fabric to cover your stitching and add edging brick stitch all around the edges. 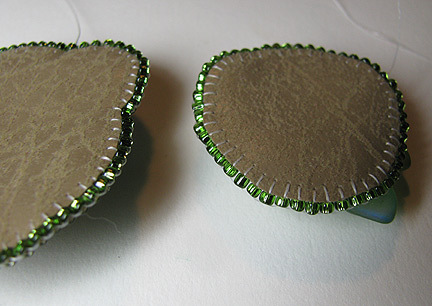 Do the same for each of the flowers you've created: add backing fabric and edging brick stitch. 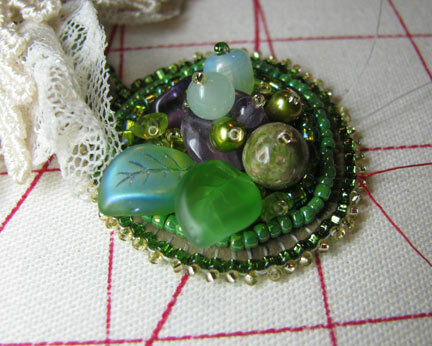 Using a necklace template, arrange the stitched pieces as desired. 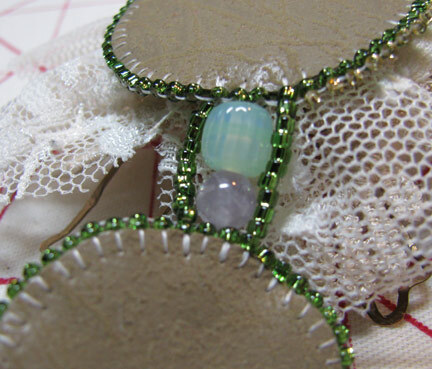 Add a strand of brightly colored thread to the spots where the elements will be joined. 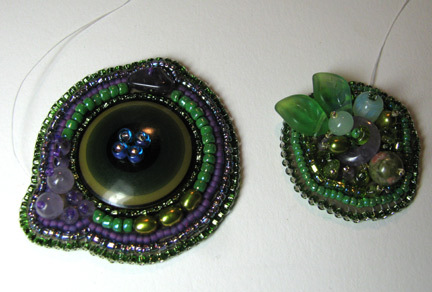 Stitch the elements together with seed beads and accent beads, stitching into the edging brick stitch on each element. 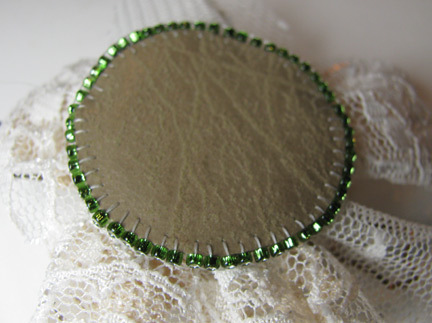 Add a picot stitch along the edges. I used smaller (size 15/0) gold beads for sparkle. 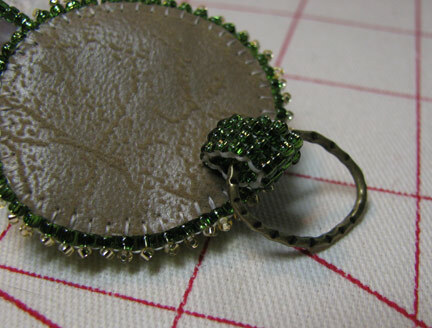 Add a square stitched bail to each end, surrounding a hammered oval metal loop. 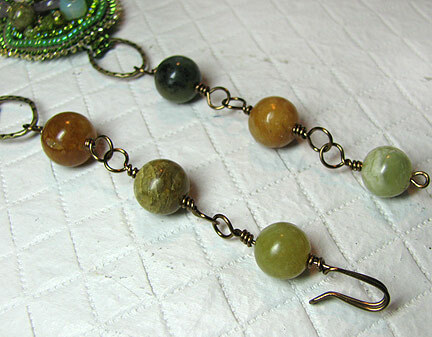 Make a chain and clasp set with brass wire and beads. Make wrapped loops for security.